I recently did these peacock batiks with Grade 3. It ties into social studies where they are learning about India. The peacock is the national bird of India. We used lots of bright colours. 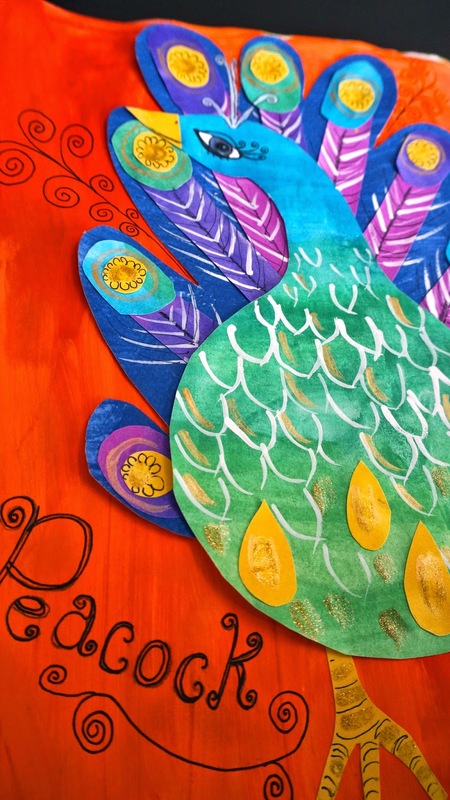 Now if you don't want to do a batik you can also create amazing peacocks in the art journal using painted papers. Cut your fabric to your desired size. Lay down some wax paper onto your work surface. Put the fabric on top of the wax paper. You can add some tape if you need to hold the fabric in place. With your pencil draw out your peacock directly onto the fabric. I asked the kids draw a large enough peacock to fill the space. Use your Elmer's gel glue and go over your pencil lines. Sometimes my students find it hard on the hands to squeeze the glue out of the bottle so I'll put some in a little cup and they use a paintbrush. Go over every line as well as whatever part of the design that you want to stay white. Keeping the fabric flat let dry. Paint the peacock using acrylic paint mixed with a bit of water. The water helps the paint flow a bit better making it easier to paint the fabric. Paint the entire piece of fabric so no white is showing. You can go right over the glue lines. Let the fabric dry. Now you need to remove the glue. Place the fabric in the sink and let it soak in some hot water. After 1/2 an hour or so give it a bit of scrub and rinse. 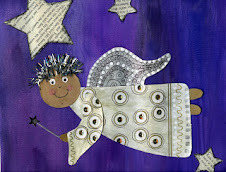 The batik is done but if you want you can add extra sparkle using glitter and metallic paints. I used the paint to add details to the feathers. That's it for the batik. You can make it into a banner, placemat or even a pillow case. You need to paint a few papers for the peacock. First I painted a paper for the body. I choose blue and green. I then painted 1/2 of a paper purple and magenta. The other half I painted yellow. I painted my background page a nice rich orange. In fact it was already painted using leftover paint from the batik. On the back of the paper I painted earlier I drew out my peacock body. I cut it out. Save the scraps in case you need them later when making feathers for the peacock. I had this leftover piece of blue painted paper so I drew out the shape of my feathers. I cut strips from the purple and magenta paper and added them to the feathers. 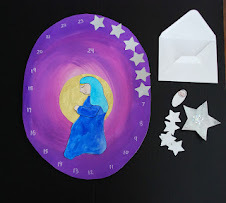 I also added circles form the leftover body paper and yellow paper. 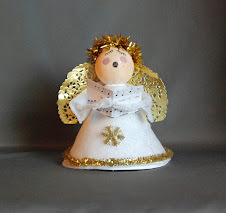 Glue into place on the background and then add body shape. I cut legs and a beak out of the yellow paper. I added paint, pencil crayon, marker, and glitter paint to further embellish my peacock. I completed these penguin portraits with Grade 1 in my last 2 residencies, (about 100 penguins!). Here are some of the student's work. This is a 2 session project. Out of recycled corrugated cardboard cut out the belly shape. It's an egg shape but then cut straight at the bottom. Coat one side of the cardboard with drywall filler. While it is still wet shake on some snow glitter. Take background and tape off a horizon line. I do this with Kindergarten to Grade 2. When they start painting the background they have a tough time stopping, the tape gives them a visual finish line. Paint the background. We started at the top with dark blue, then purple, and then light purple. We tried to do some blending so we were not too stripey. I have this great roll of corrugated cardboard. I think it is sold as packing material. You could also use paper feed thru a crimper or just regular cardboard. I gave each child a rectangle and they painted it yellow. This will be for our feet. This was the end of session 1 for us. I gave each child a rectangle of white paper about 4"x6". Using disk tempera paint we painted it for our ear muffs. They could do stripes, dots, etc. Remove tape from background. Paint bottom with white acrylic. I gave each child a 8.5'x11' piece of black card stock. We turned it the short way. Place the now dry belly on the paper, lining it up at the bottom with the paper. Trace around but leave a gap. You want the black body to be larger than the white belly. On the sides draw 2 wings. Glue the black paper body in place on the background, glue on wings. Add 2 googly eyes. I gave each child a small square of yellow craft foam and they cut a triangle for a beak. 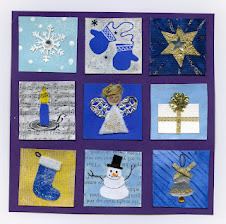 I gave them some fabric snowflakes that I get from true Dollar store to glue on the background. Cut 2 ovals out of the painted paper for ear muffs. Glue to the sides of the head. Add 1/2 of a coloured pipe cleaner for the band. Finally you can add a coat of lodge to seal everything down and give you a nice shiny finish. 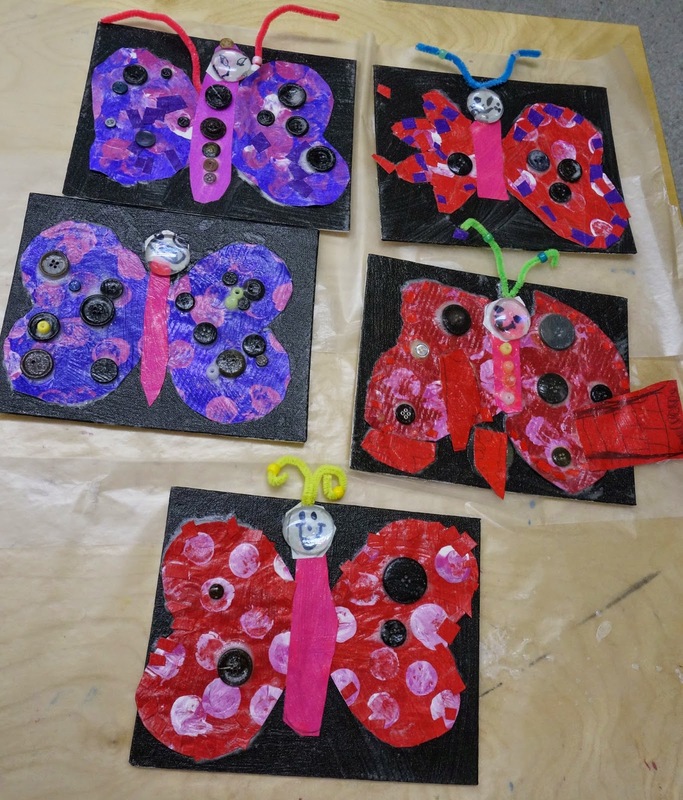 I wanted to show you our valentine butterflies that we completed in kindergarten. We used the same lesson as the warm and cool butterflies but cut 2 hearts for the wings. We also used our Valentine colours. Have a Happy Valentine's Day everyone.